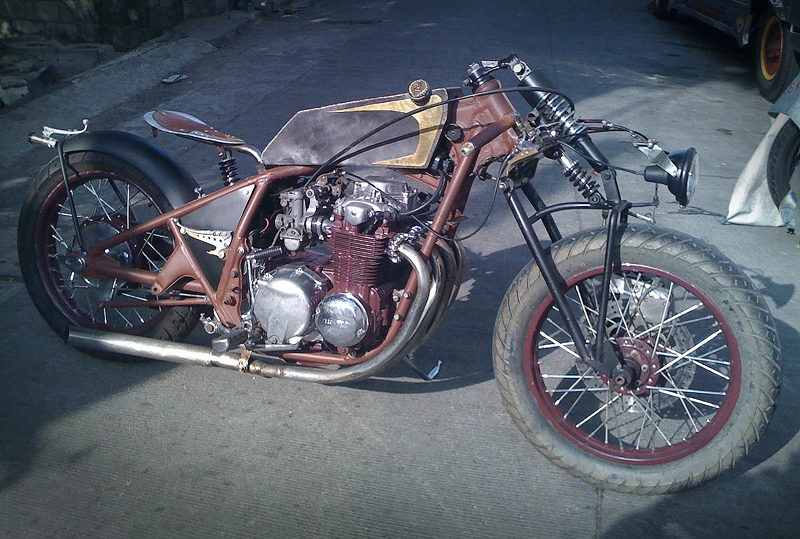 Noli Coronado is not only a silversmith for Lucky Monkey in Manilla but is also a passionate bike builder. He likes to build sculptures that have wheels and engines. Like this one-of-a-kind board tracker cross bobber he built for Ron Poe of P&P tattoo. Ron is the son of legendary Filipino actor Fernando Poe Jr. Fernando Poe’s most famous role was of Panday (blacksmith in Filipino) in the movie Ang Panday. He played a blacksmith named flavio who made his own swords and fought evil foes. Dante from Lucky Monkey tells us “The build started out as a CB550f from the 70’s complete with raked out neck and flamed tank. The bike features a girder front end, rigid frame painted in rust inspired by pandays costume. Flourishes using brass and other found objects such as wrenches were integrated into the build. The bike also contains Agimats which are Filipino brass amulets which hold magical properties that protect the rider”. This is one of the most unique and original builds we have seen in a while, almost as crazy as Noli’s previous Kawasaki KZ750 project.